Electronic cigarettes typically fall into one of three main categories: mini (cigarette-like) products, mid-size (eGo or pen-style) devices and advanced mods / APVs. Mini e-cigarettes are normally preferred by beginners because of their small, lightweight design that resembles a real cigarette, but mid-size Ego-style “vape pens” are definitely a better option for those looking for a reliable, easy-to-use product with increased performance and power. 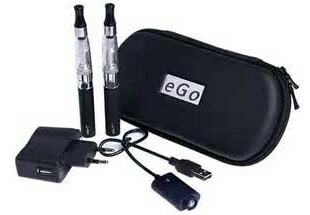 eGo e-cigarettes are known for their reliability and performance, ideal for almost every type of vaper. A top choice for “intermediate” users, many beginners, especially heavy smokers, jump right to eGo e-cigarettes or “vape pens” because they produce thicker, more satisfying clouds of vapor and last much longer than mini or “cig-a-like” products. Dozens of e-cigarette companies produce eGo’s and vape pens, but they’re not necessarily all created equal. Just to clarify, the term “eGo” technically refers to a battery originally produced by Joyetech. It’s larger size (650mAh and up) meant that eGo’s lasted 3-4 times longer than a typical mini (100-200 mAh), and the standard 510/Ego connector made it easy to connect to a variety of atomizers and tanks. Because of it’s popularity, similar products were produced by other companies and the term “eGo” has now become synonymous with this class of e-cigs. Battery Size – Most “standard” eGo e-cigs include a 650mAh or 900mAh battery, although larger batteries are sold separately and some kits may include upgrade options. The larger the mAh rating, the longer the battery will last. For most users, a standard eGo battery will last about a day, but larger 1100 and 1300mAh options are available. Keep in mind, a higher mAh rating will also mean that the battery is longer and heavier. Battery Features – A typical eGo e-cigarette will include a manual battery that is operated by pressing a button. Very rarely are “automatic” batteries available, although some exceptions exist. If you’re an advanced user, variable voltage (VV) batteries will provide more power and flexibility. VV batteries are available in some kits, but most are sold separately. Tank / Atomizer Style – The biggest difference between many eGo’s and vape pens is the type of atomizer / tank they include. Understanding your options can be a bit overwhelming, but most are sold with either cartomizers or clearomizers. Each of these options come in various configurations, so do a little research to determine which setup is right for you. Overall Price – Be sure to evaluate all of the items included with each kit. How many batteries does it include? Does it come with a charger? What about a wall adapter? All of these items should be considered when comparing prices and trying to choose the best vape pen. A “branded” eGo e-cigarette is an eGo-style product that’s been produced by a specific e-cigarette company and branded with their logo. In some cases they have the exact same components as a non-branded product, in other cases the designs are unique to the company. Branded products typically offer longer warranties, better customer support and easy access to replacement parts. 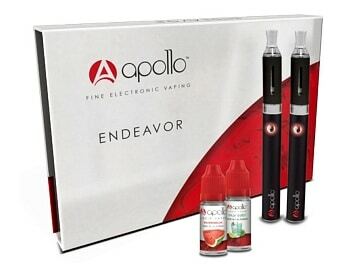 The Apollo Endevaor Kit is our favorite eGo-style product for several reasons. First, it includes two long-lasting 900mAh batteries. Second and most importantly, it features two EVOD-style tanks with dual bottom coils that perform much better than the standard, single coil tanks offered with some eGo setups. They’re easy to fill, require less cleaning, don’t leak and produce tons of vapor. Plus, you can purchase replacement coils rather than replacing the entire tank. One of the best eGo / vape pens on the market! It even includes two 10ml bottles of e-liquid. If you’d like to start off with just one battery and tank (no e-liquid), the Apollo Endeavor-X Kit is just $26.95. The Halo Triton Kit is slightly different than the Apollo Endeavor since it’s T3-style clearomizers are fully transparent and hold a bit more e-liquid (2.4ml). The tanks are single, top coil units that perform well and replacement heads are available to keep them running smoothly. Unlike Apollo which offers slightly larger 900mAh batteries, the Triton comes with 400mAh or 650mAh batteries, but 900mAh and 1300mAh are sold separately. Both kits work great and offer lots of customization options, so we proudly recommend either. The Vapor Fi Pro Kit is very similar to the Apollo Endeavor Kit, since both incorporate an EVOD-style tank system. In the case of Vapor Fi, it’s a single, bottom coil tank and it includes one 650mAh battery (1000mAh is a $3 upgrade). 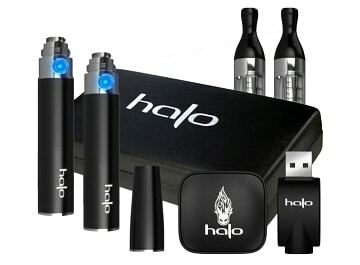 The Apollo and Halo kits include two batteries and two clearomizers, so if you take those items into account, this setup costs a little bit more than the others but it’s still a great, high-quality buy worth considering. 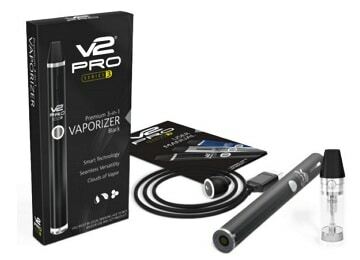 The V2 Pro Series 3 Vaporizer is a unique, stand-alone product in this category. It uses V2 Pro’s patented technology and is the only product that will allow you to vape e-liquid, loose leaf or essential oils and waxes. It includes a single 650mAh battery and one e-liquid cartridge (loose leaf and wax cartridges sold separately). All of the components are magnetic so there’s no twisting or threading, just click the cartridge, refill cap or charger port in-and-out whenever necessary. This 3-in-1 device is truly unique and it’s backed by an industry leader. STAY TUNED: V2 Pro Series 7 and 9 coming soon! The Vapor Zeus is another unique setup, unlike anything on the market. Rather than using clearomizer tanks it uses refillable “cartomizers” that hold much more e-liquid. They perform great and produce tons of vapor, but they need to be replaced after 10-20 refills. The Vapor Zeus is also the only mid-sized device available in an automatic format (no button!). Manual and dual mode versions are also available, with either 650, 900 or 1300mAh batteries. A bit expensive, but super easy-to-use and a strong performing vape pen! 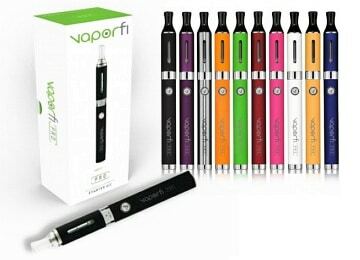 Non-branded eGo kits / vape pens are offered by almost every vaping supplier. They’re purchased directly from the manufacturers, such as Innokin, Joyetech, Kanger and others – and sold directly to the public. Prices may be lower depending on the product, but warranties are often limited and you’ll be dealing with smaller companies that may or may not provide the same level of support. 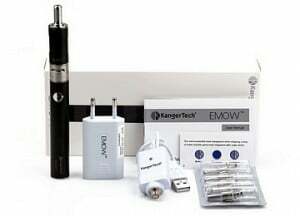 The Kanger EVOD is the go-to product for beginners that want a top performing, low cost vape pen. 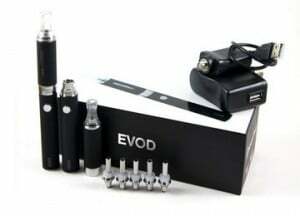 The EVOD has many nice features, including bottom coil tanks that require less maintenance and rarely leak. 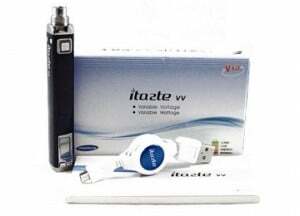 Although VV batteries are available for both eGo and EVOD setups, the iTaste VV by Innokin is designed specifically to be variable voltage and features a small LCD screen, along with a variety other features. Includes just one battery. Best for intermediate users. The newly released EMOW takes Kanger’s EVOD to the next level with a larger 1600mAh battery, variable voltage functions and an all new tank design that includes adjustable airflow and replaceable bottom coil heads. This is a nice step-up from a traditional EVOD or Ego, but not so advanced that a beginner can’t use it. One of our favorite high-end kits! The Aspire Premium Kit is another higher-end vape pen similar to the EMOW. It’s not variable voltage, but it features a large 1000mAh battery and includes the extremely popular Aspire Nautilus Mini tank system. It’s innovative bottom vertical coil (BVC) design produces tons of vapor, and with adjustable airflow, it’s super easy to customize your experience. Wow, this is a fantastic guide! I started out with the Vuse ciga-like; upgraded to an 1100 mAh eGo battery with disposable clearomizers; and have recently upgraded to the Kangertech EMOW kit. I love the performance and features of the EMOW….and I’m in a happy spot for now. The only downside is that the EMOW kit only has one battery. I’m currently on the market for another backup battery and clearomizer tank.